Dec. 18th, 2003. 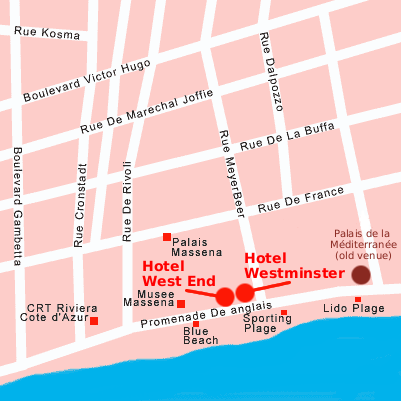 The meeting venue has been moved to the Hotel Westminster and adjacent Hotel West End. The Westminster will serve as the headquarters hotel and host the plenary sessions and posters. The breakout sessions will be split between the two hotels. Situated side by side, the Westminster and West End are beautiful examples of the prestigious "Belle Epoque" style. Nearby are over 100 museums showcasing the area's rich artistic heritage. 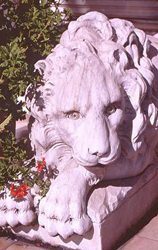 The venue is located on Promenade des Anglais facing the "Baie des Anges" and within walking distance of the narrow streets of old Nice. It is an hour and a half to major ski resorts and nearby Italy. The region around Nice boasts a truly delightful climate.